Olle 6 starts out from Seosoggak estuary. This beautiful beach and inlet are usually crowded with tourists enjoying the view, but it's a great start to the route. You may want to remember how to get there since there is also some good snorkeling to be found there. 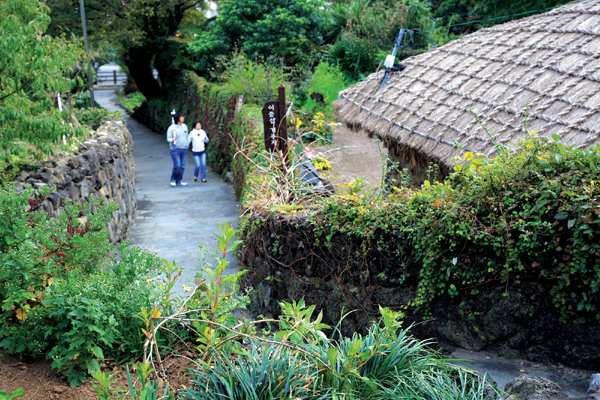 Setting off from the estuary, hikers will walk past one of Jeju's many harbors before coming to Jejigi oreum. This oreum is currently having some work done on its trails, but is still a lovely hike. It seems to be a less popular oreum which means there will be fewer people up at the top. The view is nice, but slightly blocked by trees, and it can be a little difficult to find the route back down—just look for the arrows on the ground, they indicate in which direction to go. Coming down from the oreum hikers will start to walk through some coastal forests. It is quite lovely to walk through the woods while listening to the ocean—the waves make for some eerie ambience, and occasionally hikers will be greeted by a small crab. They also have the chance to see five plant species that are unique to Korea that are considered national treasures. Leaving the forest, hikers will pass through the Seogwipo water treatment plant before going toward the Seogwipo KAL hotel. 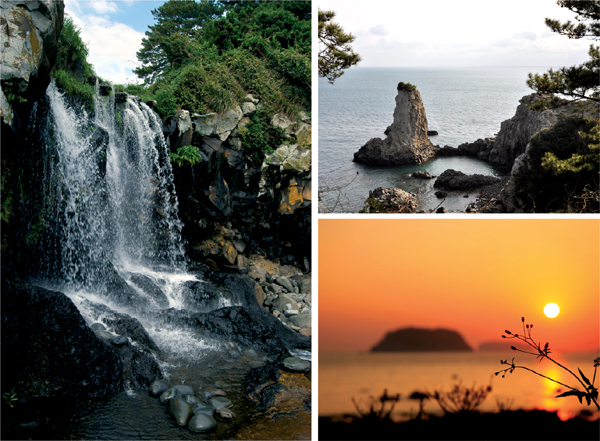 After walking past the KAL hotel, hikers will be treated to one of Jeju’s many beautiful waterfalls. Sojeongbang waterfall is a beautiful, small waterfall that is free to visit. It runs near the larger, fee-supported Jeongbang waterfall which is also on the Olle course, and makes a great detour. Leaving the coast, Olle 6 goes into downtown Seogwipo. Walkers will get to walk through the Seogwipo market and visit parts of the city. The route also goes by the gallery of Lee Jung-seop—a local artist whose work decorates the streets along the route. Walking through the city also gives hikers a great chance to try some of the local foods. The end of the route passes above Cheonjiyeon falls and through an ecological park. This area is beautiful in the afternoon or early evening. Hikers will get to walk through some of the orange orchards outside of Seogwipo. The Olle finishes at Oedolgae rock—the starting point for route 7 and the ending point of route 7.1. Hikers with any energy left by the end of the trail can take a hike up Sammaebong oreum, before grabbing a snack at Solbit Bada Cafe.